Details: Dating from just the start of the Victorian period, this painting still retains the cheerful colouration of the Georgian period. 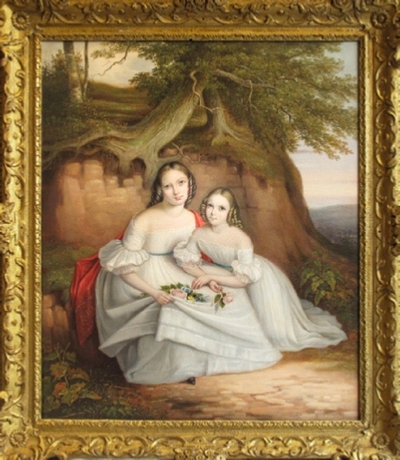 This beautiful portrait of two sisters has a very unusual style which both enhances the beauty and the innocence of two young girls. It is fair to comment that it must have been amongst the best of the artist’s ouvre. It would grace any salon. William Taylor was a London artist who exhibited 20 works at the Royal Academy and 7 at the Royal Society of Artists, Sussex Street, including “The Fair Rosamund”. Regrettably, there is no clue of their identity, but the work is signed in full at the bottom right and dated 1839. The frame is not the original, but is a good carved wood late 18thc example.